I arrived in Belfast just after 11am. McNicholl, Paul McCloskey’s agent picked me up and dropped me to my residence for the next 2 weeks. Ireland’s number one trainer John Breen, trainer to eight World champions picked me up and dropped me off to his gym in the city centre. Eammon Magee and Neil Sinclair where both at the gym. Eammon is assistant trainer to John Breen and Neil is looking for another title shot. I spoke to Neil about his time in New York as we had both spent time under manager of champions Stan Hoffman in Catskill, New York. I wrapped my hands and started to warm up. Paul came in the gym 30 minutes later and thanked me for coming. He warmed up and we got it on. The gym was baking hot with two heaters pumping away. It reminded me of Wildcard Gym in Hollywood, Los Angeles as it was an old small gym but had flavor. Nothing flashy but the grit and the dirt in the gym is something I feel builds character in fighters. Former British Champion Paul McCloskey and I traded punches for six three minute rounds. I was drenched in sweat and feeling the pace. I hadn’t sparred for 4 months since helping Ajose Olusegun for his British Championship win against Nigel Wright. I got a cracked rib in our last session and even though I went on to win in an eight round fight at York Hall in London. I just wanted to rest my rib and my hand which was troubling me for the past few years. I train from anything from twenty to twenty five hours a week when keeping myself in shape so when it comes to sparring I am fit to go the rounds. It is just a matter of shaking off the rust. 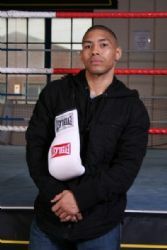 I have shared a ring with World class southpaw fighters Demarcus “Chop Chop” Corley, Ajose “Ring Marshall” Olusegun and Frankie “El Gato” Figeroua so I can handle southpaw’s and not worried about them. Some fighters hate southpaws and build up a fear of them. I am not one of them. Paul and I had six good rounds. I knew he would try put it on me as it would be the first time us sparring and he knows one day we could share a ring for more than just training purposes but for a major Title. We did some boxing and mixed it up with fighting. I personally feel I did better when in close. Paul has a good right uppercut but his downfall is sometimes he laspes on his defense. He can be elusive and make you miss shots. I will be filming the rest of our sessions as John Breen and Paul don’t mind. I am looking forward to the next sessions we have together as we will only get better. Dmitriy “Star Of David” Salita emailed me today. He will be in London on Thursday for a press conference as he is fighting Amir Khan in a few weeks. It’ a shame I am not in London as I would have loved to have shown him some support and had his back there. Went for a run this morning around the town and finished up with 10 sprints on a 5 a side soccer pitch. Had some breakfast and chilled until John Breen came round to pick me up at 12.30pm. Got down to the gym and did some shadow boxing until Paul arrived. I was feeling better than my first day here and more relaxed. I had former Commonwealth and British Champion Eammon Magee doing my corner. He gave me some good advice but I didn’t execute too often. I felt better in the ring and more relaxed. I was not as tired as my first day but I was still unhappy with my performance. My shots where not rapid and I wasn’t pulling the trigger. I am rusty but I am seeing shots but my hands are not going. It is my first week of sparring in four months but I am not happy with my work so far. Eammon thought I was better today but John Breen thought I boxed better yesterday. Finished off with some skipping, speedball work and abdominals and that was me for the day. I am not trying as much as I want to be sharp for my sparring sessions. I will try to mix in some swimming and yoga with the running so I will alternate it on certain days. Went to the cinema to watch Halloween 2 in the evening and went home to watch News night on BBC 2. Sparring today, I was looking to improve on the previous two days. The first round I was very happy with but the remaining rounds of sparring I was not happy with. Paul has done fifty odd rounds plus already and this is me just starting but I expect more from myself. I am getting in shape anyway and my defense is decent and I am working on different things every day. My fitness is just not able to maintain. I spoke to Cestus management last night about my proposed bout in December. Hopefully it gets finalized in the next week as starting my first two weeks with Paul McCloskey and then continuing with Ajose Olusegun before heading to the States to finish off. Every day I am improving in certain departments. By next week I hope to see an improvement. I hurt my right elbow yesterday and it feels worse today so I bought an elbow support which was not much help so have taken pain killers to numb the pain. Today I took a rest from running as I felt sore and tired in sparring yesterday. There where loads of press in the gym today. It felt like being in Wildcard in Los Angeles as it was packed out. Paul did some Interviews while I was warming up. Today was probably my worse session sparring. I was slow and I had no ideas. I was basically on the defense. I feel I do good when I am on my toes as Paul seems to miss with his big shots when I stand there I have to be sharp otherwise he makes his move. Eammon Magee is who has been doing my corner is a funny guy and a tough man. You can see he has no fear in his eyes. I think he will become a good trainer if he can stay out of trouble. Paul and I completed four rounds sparring until Paul pulled up with a hurt hand. We have done 24 rounds together which is more than enough. I expect to do much better from Monday. I got a full body massage to relax my body and to try release the tension in my back and arms. John Breen picked me up and took me to his house for my first home cooked meal of the week. His Wife is a lovely lady and made me feel welcome in their home. Also, she commented on my good looks and pearly whites so that was a bonus. Ran around Belfast City Centre this morning then finished off with a jog around Parkview Lake which is opposite where I am staying. Paul was in the Daily Mirror today talking about his European Title fight I am getting him ready for and how he thinks Amir Khan is the weakest Champion out there in our division. I agree with him. I had a day off sparring with Paul as his Physio told him to rest his hand until Monday when we will combat again. I asked John Breen if I could spar Kevin O Hara as I had watched him spar in the week and he is a nice boxer. We did some rounds together and it was nice to spar an orthodox fighter. I still felt sore and hurt my right hand, my nose is sore and shoulder feels stiff so weekend I will take off from Boxing but do some fitness work instead. Today I took a break from Boxing and went to the Grove Leisure Centre on York Street to do two hours of a spin class, Boxercise class, pilates and yoga. It was good to take a lighter workout and stretch out my sore muscles. Afterwards I went to get a facial and massage at the Beauty and Tanning Bay in Belfast . It was good to pamper myself after a week of hard sparring. Today was the day I chose to go to Dublin and visit my grandmother. I haven’t seen her in a few years so I was looking forward to it all week. It was a six hour round trip to Dublin from Belfast but well worth the journey. As a kid I had never really spent time with her so the time spent with her was priceless to me. I told her about my traveling through Boxing and my calendar, novel and clothing line. I made sure I dropped some of my outfits on her and I gave her some birthday money as she was 70 on the Tuesday. I left and did some souvenir shopping in the city centre and made my way back to Belfast. I was happy with the trip and it was a great day. I had hoped that I would be refreshed and ready to go for sparring with Paul today as the first week with him if I could judge my performance was a five out of ten if not less. I would have one good round then blow out of steam. My general fitness was good as I have been doing Boxing workouts, Circuits and my running with yoga and pilates thrown in but when you are not training for a fight it is not full out so I struggled the first week. Today I performed well and held my own. I would say I was a seven out of ten as I felt like I was holding my own and finished the rounds well, throwing combinations and flurries. Paul said his right hand is still not 100% from last Friday. This week will be more speed and technical sparring most probably but I plan to continue with the form I showed today. At the end of the day, Paul and his team have flown me over to Ireland to help prepare Paul and it is my aim to make sure he gives a good account of himself and comes home with the European Title. I have continued with the fine form I showed yesterday in sparring. Working the jab and throwing combinations. I am working at 70% now I would say. I am still making some mistakes but on a whole my defense is on point and my offense is on point. Last week I was throwing single jabs and Paul was countering me but today I through two and three jabs which where more effective than the single one of last week. We completed six competitive rounds of sparring with skill, speed and technical work all included. It was fun and I am enjoying the sessions more than last week as last week I felt like a human punch bag as I was too rusty to compete with Paul. Now I can. I met a guy in Catskills 20 months ago when I was in Stan Hoffman’s training camp training for the Ali Oubaali fight. He remembered me and we got chatting. He said he was impressed with my sparring. I told him This is my second week of sparring after four months of inactivity so there is much more in the tank. Went to the Beautician for a Body Detox session afterwards then John Breen took me round to his house as his wife had invited me round for dinner. After that I went to the movie theatre to watch Vampire’s assistant. Headed home and relaxed watching some television. I went for my morning run around Belfast city centre then finished with a lap around Parkview’s river. Just over forty minute run. My training is going good and I was 149lbs after training. I am handling my business getting in shape and getting my weight down. I just hope my new management are handling their’s and securing the title fight they have been promising me for the last few months. I was offered the chance to headline a show at York Hall in London on December 6th. I have to wait and see what happens with this proposed title fight. Coaches Eamonn Magee and John Breen said I sparred the best since being here. I thought I put a better performance in yesterday but they disagreed. There was one round where I let a lot of shots off on Paul and he didn’t really fire back. I thought he had hurt his hand but he said he was just changing up tactics. Well everyday this week I had got better so Thursday and Friday hopefully I will end to the performances this week. Did an interview today and spoke to the film maker who is making a documentary on me. Been promoting my Calendar as well to boost sells for the charities the profits go towards. On the way to sparring I received a call from a friend back home in London, he was enquiring how sparring was going on with Paul. He told me that M’Baye had pulled out and that Matchroom was looking for a replacement. Paul didn’t tell me at the gym but John told me after that they would go down the rankings looking for a suitable replacement. I am 14th but with Ricky Hatton, Junior Witter and Amir Khan all on the World level. Ted Bami or Colin Lynes are fighters I think would be top of the list as they are used to losing and have no real major talent. Today’s sparring was fun. Every day I am improving so I know my fitness, timing, speed, awareness, accuracy is all coming together. Paul started off good doing what I know the tactics what John Breen would prefer him to use, working behind his jab but I closed down the space to make It close and that has suited me all this week. Staying in the pocket as we say in the Boxing world. We worked at a fanatic pace. Working our jabs and combinations, blocking, ducking and weaving. If my team can finalize my fight for December 3rd that would be great as everything is coming together. My talent is known by people in the gyms who have seen me spar with World class boxers, it’s all about me getting those fights I crave. Finished my day off with a manicure, pedicure and massage. It is important for boxers to look after their hands and feet as this is what we use to ply our trade. Not enough look after their bodies. I got up just after six this morning. Before my alarm could wake me I was up and ready to pound the mean streets of Belfast. I went on my long run with ends up with me running to the Grove Leisure centre then coming back round to run around Parkview river. It took just over forty five minutes. I relaxed in the morning and waited for John Breen to pick me up for Paul and I’s last session. I was looking forward to it as ever since Monday I have been improving in every capacity and being my last day. I wish to finish on the fine form I have shown through the week. We got to the gym an hour early as I had to get to the airport for 3pm. We only did four rounds sparring. Paul wanted more and so did I but John said the hard work had been done. Paul worked on speed and boxing. I thought he boxed his best this week so that is good as it was his last day sparring. Did some shadow boxing, hit the speed ball and heavy bag and finished up with skipping and abdominal work. Through the week, I felt strong, fit and focused as I had my Wellman Sport vitamins in the morning. I would rub my whole body with the Wellman gel before going bed to ease off the pains from sparring in the day. I would take For goodness shakes after my sparring sessions and I ate a HIGH5 energy bar or sports bar before we began our workouts to give me high energy for my high performances I like to achieve. I would back down the HIGH5 energy gel five minutes before sparring. As the rounds went on I always felt stronger so I would be upset when our rounds where cut short for whatever reason as I was in the zone. HIGH5 isotonic drink was perfect to drink in between the rounds as it is perfect for training in the heat and with two heaters blasting away it helped me hydrate my body quickly. I would add in a Wellman fizz tablet in my bottle which has vitamins and mineral with some ginseng for good measure. Being a sportsman you have to look after your body and watch what you eat so I am very choosey on what goes into my body. I gave a good account of myself and I left with my head held high. Paul dropped me off to Belfast International airport and we had a chat about boxing and his new opponent Spain's "Cobra" Daniel Rasilla. Paul should stop him mid by round six. Overall my trip to Ireland was a productive one. I started the week slow but on the second week I started to find form and have some good entertaining rounds with Paul. Definitely worthwhile! I would like to thank John Breen and everyone at the gym. They are great guys.